The TV guide doesn’t know who you are, what your favorite movie genre is, what you’ve watched in the past, what your mood is, and so on. Because of that, it is incapable of providing you with any recommendations about what to watch on your TV, or which videos you’re likely going to enjoy consuming right now on your PC or even your mobile phone. With the sheer volume of available channels and VOD content out there, that’s becoming quite a problem for many people. But if beeTV has its way, that problem could soon become a nuisance from past times. The Milan, Italy-based startup founded in 2006 by an international team of experienced technology and media experts, has just raised $8 million in Series B funding from Italian VC firm Innogest, the largest investment this fund has ever made. BeeTV aims to use the capital to ‘change the way we watch TV’ by pioneering what it calls a Personal Content Channel (PPC), a personal TV suggestion engine that helps you find your way in the ocean of VOD titles and channels out there by surfacing the best choice for you based on your profile and even the mood you’re in. The company’s recommendation engine comes in three flavors: beeSTBox is its flagship product which was launched at the recent DEMOfall 08 conference in San Diego (see video below). It’s a solution designed for multicast distribution platforms including cable, satellite and IPTV. 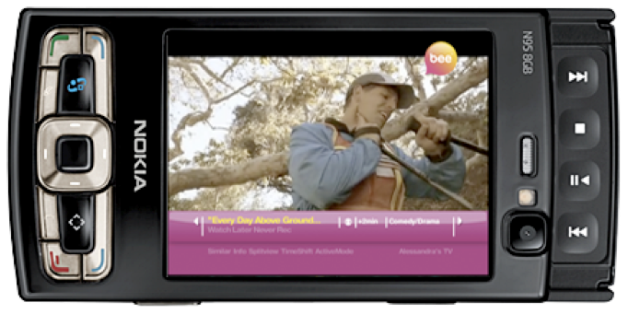 To manage, control and share your online TV viewing experience, the company created a product called beeWeb, and it’s also bringing the PCC to mobile devices to enable always-on connectivity and the ability to interact with set-top boxes on the go. 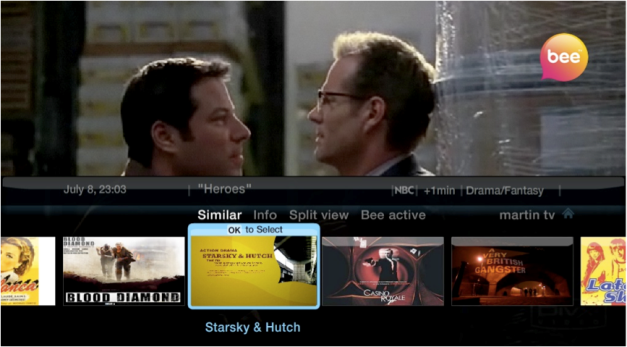 It currently has an iPhone application in the works that will allow TV viewers to control their STBs, get recommendations for shows & movies that are relevant to them and available in their specific TV subscription, and also enable them to watch trailers and set their STBs to record or create notifications for the shows they would like to watch. BeeTV is currently focusing on finalizing its 1.5 version and claims to be engaged with some of the leading TV providers in the world for trials that are expected to roll into their commercial phase by the end of 2009 and beginning of 2010. I wouldn’t be surprised if there was actually a lot of interest for this type of technology coming from content owners, publishers and media companies. This one looks like a winner, and that was even before I knew who is spearheading the algorithm team that’s responsible for the powerful recommendation technology behind the platform: Gavin Potter, an experimental psychologist formerly responsible for IBM’s Centre for Business Optimization in Europe, who you might know as “Just a Guy in a garage” from the Netflix Prize competition. See this Wired profile for more background on the man. I’m just hoping beeTV and their investors are in it for the long run and don’t get acquired by one of the majors before they have the chance to expand their platform on a worldwide scale through partnerships and white-label distribution deals. Because everyone deserves the right to stop wasting time looking for content they want to consume thanks to sophisticated technology that relieves us from the need to make choices for ourselves.